Prince Gustaf Adolf Oscar Fredrik Arthur Edmund, Duke of Västerbotten (22 April 1906 – 26 January 1947) was a Swedish prince, directly in line of succession to the Swedish throne. He was the eldest son of Gustaf VI Adolf, who ascended the Swedish throne after his son's death. The current king, Carl XVI Gustaf, is Prince Gustaf Adolf's son. The prince was killed on 26 January 1947 in an airplane crash at Kastrup Airport, Copenhagen, Denmark. Gustaf Adolf was born in Stockholm on 22 April 1906 as the eldest son of the then Prince Gustaf Adolf and Princess Margaret. He was known by his last given name, Edmund, in the family. Gustaf Adolf passed studentexamen at Stockholm Palace in 1925 and attended the Cavalry Officer Candidate School (Kavalleriets officersaspirantskola, KavOAS) in Eksjö the following year and in 1926-1927 the Royal Military Academy. He was then commissioned as fänrik in the Svea Life Guards (I 1) and the Life Regiment Dragoons (K 2) and in 1928 in the Life Regiment of Horse (Livregementet till häst, K 1). Gustaf Adolf continued his military training and became major in 1941. He was lieutenant colonel at his death. From 1932, Prince Gustaf Adolf was chairman of the Swedish Scout Council and from 1937 honorary chairman of the International Scout Committee. Since 1933, the prince was also chairman of the Central Board of the Swedish Sports Confederation, the Swedish Central Association for Sports Promotion (Centralföreningen för idrottens främjande) and the Swedish Olympic Committee. Prince Gustaf Adolf was chairman of the Royal Swedish Aero Club from 1937 and the Royal Automobile Club from 1939. Some recent journalists and historians portray Gustaf Adolf as sympathetic towards the Nazi movement in Germany in the 1930s, a highly debated and criticised opinion. As an official representative of Sweden, Gustaf Adolf met with many Nazi leaders, including Adolf Hitler and Hermann Göring (the latter had lived in Sweden and had many friends among the Swedish upper class). His father-in-law, Charles Edward, the deposed Duke of Saxe-Coburg and Gotha, was one of the few members of any of the former German princely houses who was a Nazi supporter, but this does not mean Gustaf Adolf was. As the prince very rarely spoke of political matters and left no written evidence of any political sympathies of any kind, the subject remains very much a matter of speculation. According to journalist and author Staffan Skott in his book Alla dessa Bernadottar (All these Bernadottes), letters and diary entries by influential Swedes of decidedly anti-Nazi persuasion disprove the rumors. Such documents include those of the diplomat Sven Grafström and of the wife of the cabinet minister Gustav Möller, as well as of the stepson of Hermann Göring, who said that a visit by the prince to Göring's home was a complete failure and that Göring and Gustaf Adolf did not get along well. The newspaper Expressen said that "plausible witnesses who were also strongly pro-democracy" had denied the rumors. The Swedish Royal Court made a statement denying any knowledge of Nazi sympathies. Gustaf Adolf expressed his support for Finland during the Continuation War of 1941–1944, and would even have liked to participate as a voluntary soldier in the Winter War of 1939–1940, but the King's disapproval prevented this from happening. Gustaf Adolf was an accomplished horse rider. He competed in show jumping at the 1936 Summer Olympics, but failed to finish. He served as president of the Swedish Olympic Committee from 1933 until his death in 1947. Gustaf Adolf joined the Boy Scouts, and as an adult became a Scoutmaster. He earned his Wood Badge beads at Gilwell Park in England. When the Svenska Scoutrådet formed he served as its first president or Chief Scout. He led the Swedish contingents at the 5th World Scout Jamboree in 1937 and at the World Scout Moot in 1939. He served on the World Scout Committee from May 1937 until his death. Princess Margaretha, Mrs. Ambler (born 31 October 1934) she married John Ambler on 30 June 1964 and is his widow. They had three children. Princess Birgitta of Sweden (born 19 January 1937) she married Prince Johann Georg of Hohenzollern on 25 May 1961 and is his widow. They had three children. Princess Désirée, Baroness Silfverschiöld (born 2 June 1938) she married Baron Niclas Silfverschiöld on 5 June 1964 and is his widow. They had three children. Princess Christina, Mrs. Magnuson (born 3 August 1943) she married Tord Magnuson on 15 June 1974. They have three sons. Carl XVI Gustaf of Sweden (born 30 April 1946) he married Silvia Sommerlath on 19 June 1976. They have three children. 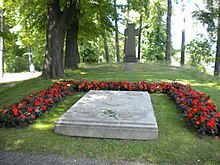 Gustaf Adolf's and Sibylla's grave on Karlsborg Island in Solna, Sweden. 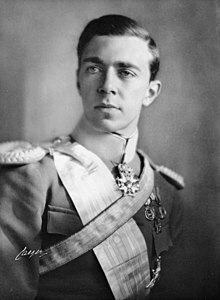 Prince Gustaf Adolf was killed in an airplane crash in the afternoon of 26 January 1947 at Kastrup Airport, Copenhagen, Denmark. The prince, along with two companions, was returning to Stockholm from a hunting trip and visit to Princess Juliana and Prince Bernhard of the Netherlands. The delayed KLM flight from Amsterdam had landed at Copenhagen for a routine stop before continuing to Stockholm. Soon after the Douglas DC-3 aircraft took off, it climbed to an altitude of about 50 meters (150 ft), stalled, and plummeted nose-first to the ground, where it exploded on impact. All 22 people aboard the plane (16 passengers and six crew members) were killed. Also aboard the ill-fated flight was American singer and actress Grace Moore. An investigation found that, short of time, the plane's captain had failed to perform the final pre-flight check list properly and took off not realizing that a gust lock on an elevator was still in place. At the time of his death, Prince Gustaf Adolf had been second in line to the Swedish throne behind his father, the Crown Prince, who in 1950 became King Gustaf VI Adolf. The younger Gustaf Adolf was succeeded as second in line by his only son, Carl Gustaf (at the time only 9 months old), who would later succeed his grandfather in 1973 as King Carl XVI Gustaf. The arms of Prince Gustaf Adolf were those of the Kingdom of Sweden, with a quarter with the arms of Västerbotten in base. ^ a b Rudberg, Erik, ed. (1948). Svenska Dagbladets årsbok TJUGOFEMTE ÅRGÅNGEN (Händelserna 1947) [Svenska Dagbladet's Yearbook TWENTY-FIFTH VOLUME (Events of 1947)] (in Swedish). 52. Stockholm: Svenska Dagbladet. p. 8. LIBRIS 283647. ^ Kroonenberg, Piet J. (1998). The Undaunted- The Survival and Revival of Scouting in Central and Eastern Europe. Geneva: Oriole International Publications. p. 31. ISBN 2-88052-003-7. ^ Kroonenberg, Piet J. (2003). The Undaunted II–The Survival and Revival of Scouting in Eastern Europe and Southeast Asia. Las Vegas: Las Vegas International Scouting Museum. p. 77. ISBN 0-9746479-0-X. ^ a b "Prince and opera star killed in plane crash". Ottawa Citizen. Associated Press. 14 March 1954. Retrieved 1 June 2014. ^ "Douglas DC-3C (C-47A-30-DK) PH-TCR Kobenhavn-Kastrup Airport". Aviation Safety Network. Retrieved 1 June 2014. Wikimedia Commons has media related to Prince Gustaf Adolf, Duke of Västerbotten. This page was last edited on 12 April 2019, at 21:26 (UTC).